Decorating a bathroom is a wonderful opportunity to flex your creative muscles. It’s essential, however, to remember that this room should remain a serene space to all who use it. In conjunction with working around a bathroom’s fundamentals (i.e., shower, bathtub, vanity, sink, towel rack), you’ll want to infuse your own aesthetic preferences into this space. At the same time, it’s wise to keep this space uncluttered and versatile. This is why we recommend taking a minimalist approach when designing your bathroom. Minimalism doesn’t have to be boring. For those looking to bring a pop of contemporary color into the mix, try painting a single surface, like the ceiling or the floor, while keeping the rest of the room within the same color family. If that feels too bold, try inserting small color accents with accessories. One word of caution on this note: choose one color on which to focus, so it doesn’t end up looking scattered and disorganized. Another way to make your bathroom a haven of tranquility is to go back to basics with wooden accents. Neutral in palette, warm wooden cabinetry, shelves, or even wastebaskets are a great way to balance the sleek modernity that the rest of your bathroom may be channeling. There is a lot of versatility afforded by incorporating wooden accents into your bathroom. To bring warmth into the room, try a deep chestnut. For a lighter, airier feel, go for white-stained or even oak. White may seem like the go-to for all things minimalism, but that doesn’t mean you can’t add in a contrast. A matte black frame on a shower screen, or sleek black faucets are a great way to add variance to an otherwise all-white room. Again, simplicity is best, but there is still wiggle room within that construct. Hexagon-tiled walls add texture and pattern to the room, making it 3-dimensional. Also explore concrete floors for additional texture. This pairing will allow each feature to stand out in its own right. Consider adding green life into the room with potted plants. 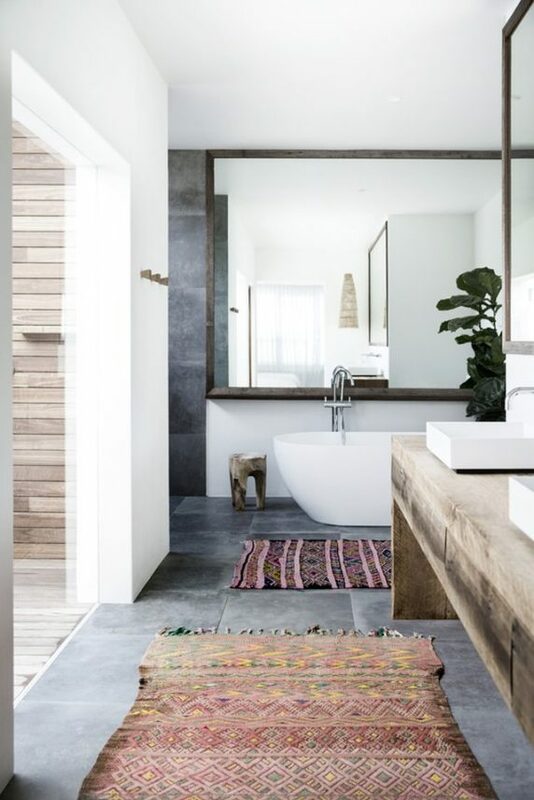 Here’s a twist: The Bohemian Minimalist Bathroom. You probably didn’t think those words would ever be said together, but the fact of the matter is that this design trend is not only possible, it’s actually incredibly effective! 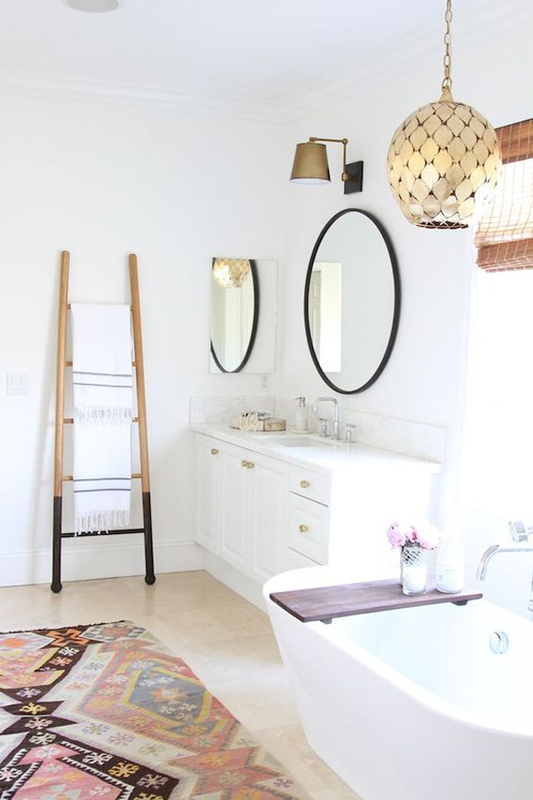 Sticking with the already-mentioned fixtures and colors and adding small but impactful enhancements such as colorful rugs, tapestries, chandeliers, and curtains can keep your bathroom as a true reflection of your style while preventing it from getting cramped. Finally let’s talk about bathroom sinks and faucets. To continue with the minimalist approach, consider the various types of faucets that pair perfectly with above counter, vessel sinks. Most wall-mount or waterfall faucets will be a great fit with any vessel sink. The Begonia Matte Stone vessel sink, for example, has a shallow basin but a broad, tapered surface area. Coupled with the elegantly-sloped wall-mount Olus faucet, available in antique rubbed bronze, matte black, chrome, or brushed nickel finishes, and this set is everything you need for serene minimalism. 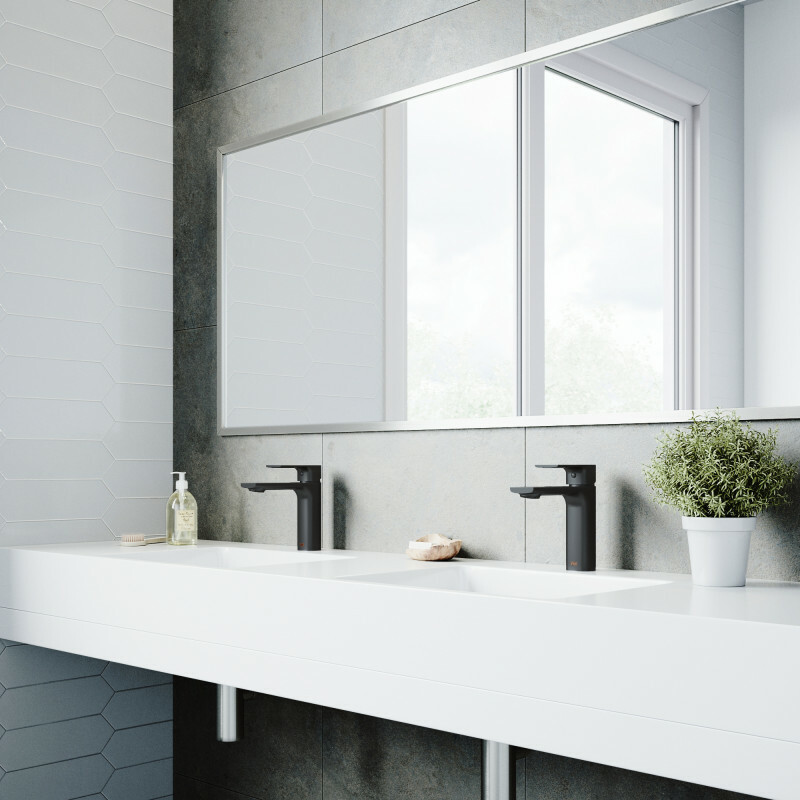 For more ideas on how to take a minimalist approach when outfitting your serene bathroom, check out VIGO’s entire bathroom collection.